What a contrast to the condition of affairs which prevailed throughout the preceding reign, when rest and pleasure came as a relaxation from, but still were regarded as an interruption of, work. Under the indolent sway of Philip of Orleans, and later of the rightful sovereign himself, work seemed to be regarded in the light of an interruption of the pursuit of pleasure—as a necessary evil; and all who could shirk it, by any means whatsoever, did shirk it most effectually. 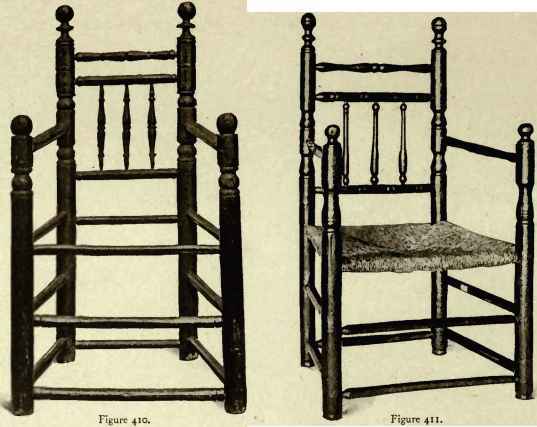 The " Louis-Quinze" chair, for instance, with its silent eloquence, tells a story different from that told by its comparatively severe predecessor. It does not grudgingly proffer its services for temporary repose with the suggestion that we shall rise from it with renewed energy for further labours, but tempts us by its sinuous and subtle allurements so hard to be resisted. " Come," it seems to say, " come, my inviting arms and downy softness await you. Why think of work when I am here ? Come, and forget all in my embrace. Take your fill of placid enjoyment; throw all else to the winds ; and let others work who will." Something purely sensuous, indeed, pervades the whole of the best and most typical "Louis-Quinze," which more than merely reflects the prevailing spirit of the times; it is literally steeped in it in every form and detail. Everywhere we have the bewitching female face—not of the saint, but of the syren—smiling up into ours, and tempting us to linger. Figures are clad in the lightest of light draperies, which accentuate rather than conceal; and the female bust itself, but partially covered if covered at all, is wherever possible brought into undue prominence. Truly, these things constituted a fitting environment for a prince possessed of such predilections as was Louis the Fifteenth.